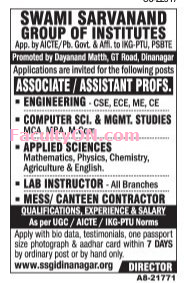 Swami Sarvanand Group of Institutes, Dinanagar has advertised in Tribune newspaper for the recruitment of Associate Professor/Assistant Professor jobs vacancies. Interested and eligible job aspirants are requested to apply within 7 days. Check out further more details below. About College: Dayanand Math Dinanagar is the centre of socio-cultural, educational and spiritual activities. The Math was established by Param-Poojay Swami Swatantranand Ji in 1938 and was formally registered under the Indian Trust Act in 2001. Among its multifarious activities, the Math was instrumental in providing necessary managerial and financial inputs and established a number of educational institutions, schools and colleges in and around Dinananger, Poojya Swami Sarvanand.